Stunning Water Views. Near Falmouth, Truro, Helford River, South & North Coasts. 1 Double bedroom, large en suite bathroom, spacious living for a couple. Set at the northern end of Stithians Lake with uninterrupted southerly views down the length of the lake, this recent barn conversion is an ideal base to explore the South and West of Cornwall. The views down the lake are truly outstanding and it is located just 70m from the waters edge. Beside the lake and just a couple of hundred metres away is the award winning Golden Lion pub and restaurant itself adjacent to the lake's water sports centre where you can hire windsurfers, sailing boats and kayaks or sign up to learn each sport. Fishing is also available. There are also plenty of walks and cycle routes, you can start a 6 mile circuit of the lake from right outside your door. The property is the southern end of the Penhaveor Barns conversion and has a well equipped spacious kitchen, lounge/dining room, bedroom and bathroom. Outside there is a private terrace and BBQ area as well as communal parkland down to nearly the waters edge. Expect all that you need to enjoy your stay in comfort and some luxury with a fast wifi and broadband connection, tv and DVD player. In the kitchen a washing machine and dishwasher will help ease the chores. The South facing bedroom wall is nearly all glass giving magnificent views and there is a second TV, large king size bed and solid oak wardrobe and chest of drawers. The bathroom features stylish twin sinks, wc, walk in shower and a luxurious egg shaped bath. It's lakeside location is just a short drive from both north and south coasts and handy for Truro, Falmouth, St Ives, Helford and beyond. I have been renting properties either at this location or in France for many years. Stunning views and within short walk of country pub. The property sits a few steps from the lake's circular 6 mile walk. A dog friendly property with your own enclosed doggie paddock as well as an enclosed garden. Washing machine with very useful 15 minute short wash! 2 comfy settees, coffee table, original Cornish art on walls. Large flat-screen TV. DVD player. Lovely view over the water - already booked another visit! Whilst the weather could have been a lot better, with high winds, mist and rain, this property more than adequately made our stay worthwhile. It is in an idyllic scenic location and convenient to visit all the usual tourist spots. Very well prepared property with all mod cons, made to feel welcome by both Mandy & Charlie who gave a good insight into the surrounding area. The only comment which would be the icing on the cake would be to add a hot tub, as we normally look for property with one. But this would not deter a second visit to this lovely place again. Great experience - we were made to feel very welcome; all so spacious, such great quality in every aspect. Henry the Beagle loved the lake - didn't stop smiling every time we took him over there. A truly delightful place and really made our holiday, thank you! Fabulous! Property presented to very high standard. Book if you are visiting this area of Cornwall. It’s great to comment on this high standard property. It is in a lovely, quiet setting with a large enclosure for the dog to run in as well as a private garden. Inside the property does not disappoint; it has everything you could need and was immaculate on arrival. Lovely welcome even though we were early! Thank you Mandy for your kindness regarding alternative welcome goodies for gluten free. Very much appreciated after a 6 hour journey. Charlie showed us meticulously around the cottage and was very helpful throughout the holiday with sound nuggets of advice as to where we might like to walk with our dog. 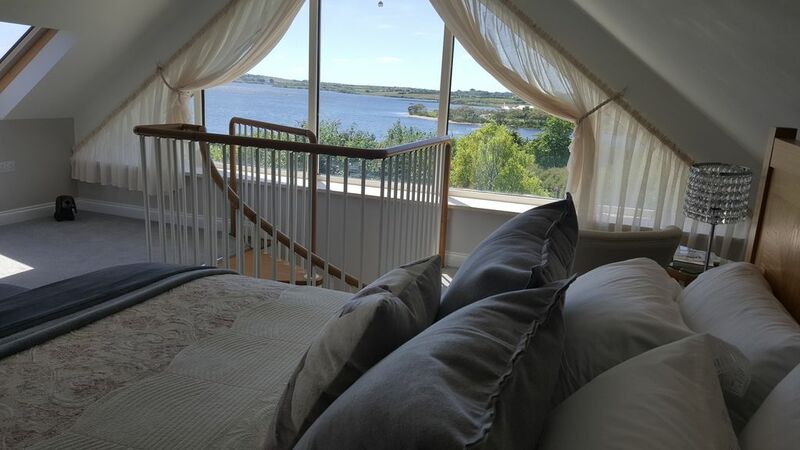 The view from bedroom was spectacular overlooking the reservoir. Dogs were welcome on the left side of Gwithian beach, which is a great day out for all. Enjoyable walks at Trebar which also has a beach even though it is mainly fabulous gardens. Really good day out with good food and fantastic ice-cream on the beach. Again dogs allowed in the sea, but you must keep them on lead until you reach the waters edge. Lovely drive along the coast with ample opportunity to stop and stare or have a walk. We had a great week and would definitely return when visiting this part of Cornwall again. Thank you once again Mandy and Charlie for making our stay special. Doreen and John and of course Rosie the vizsla. We stayed for a week in July and this property did not disappoint in any way! From the welcome goodies (including delicious scones with jam and cream, wine and Cornish ales after a long walk on the coast) to the gorgeous view overlooking the lake, this place is lovely. It's delightfully furnished, in an ideal location to explore many parts of Cornwall and there's a great pub just around the corner for an evening stroll and a pint or two! We had a great time (wish it had been longer than just a week) and would definitely recommend this property. Thank you Charlie and Mandy. No additional cleaning fees or damage deposits are charged at outset. The property should be left reasonably clean, should it not be or items are damaged, cleaning and/or damage charges will be applied. Should the owners deem it necessary a damage deposit may be requested on arrival or at any time subsequently during the stay.